George Washington, Benjamin Franklin, Alexander Hamilton… Babe Ruth, Jesse Owens, Vince Lombardi… John Wayne, James Dean, Katharine Hepburn – these individuals, among many, are easily recognizable. However, there are quite a few historical figures who, while having adorned the pages of many a newspaper, are far from household names. Such is the case with Joseph A Turner. Who is he? What was he known for? When did he live? 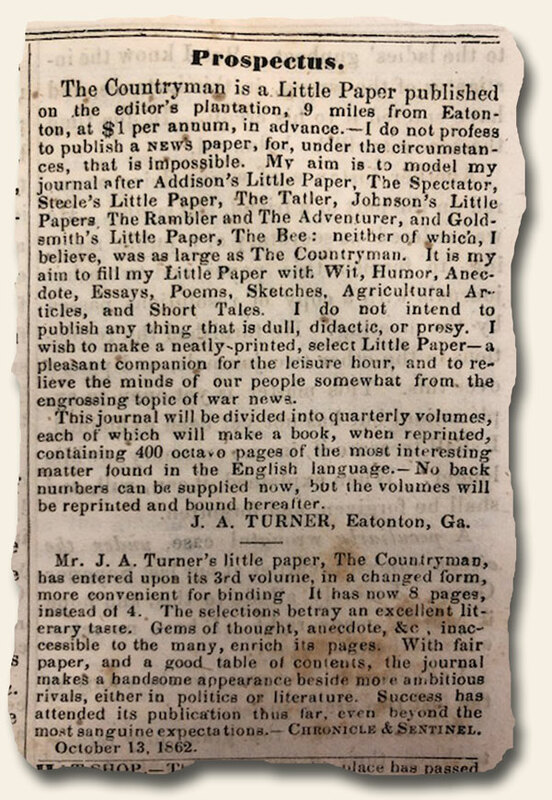 Mr. Turner just happens to be the publisher of what is believed to be the only Confederate newspaper printed/published on a Southern Plantation: The Countryman. He was the owner of Turnwold Plantation, located about 9 miles from Eatonton, Georgia – of Chick-fil-A, J.C.H. (see below), and The Color Purple fame. As if this distinction were not enough, he took on Joel Chandler Harris – the eventual famed author of the Uncle Remus, Br’er Rabbit, and Br’er Fox stories, as an apprentice at the age of 14 – and trained him to serve as the typesetter for the newspaper. We recently came across an interesting issue of “The Daily Rocky Mountain News” from Denver, dated Oct. 4, 1864. The uniqueness was not in the reporting; it was in the newspaper itself. 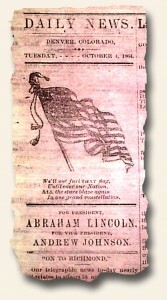 Rather than printed on traditional newsprint stock, this issue is printed on pink-colored tissue paper. Fortunately, although very flimsy, it is not the least bit fragile. It was not unusual for print shops to run out of newsprint and to become inventive in finding ways to get out the day’s edition, particularly for newspapers in remote parts of the country as most paper mills were located in the Northeast. Think of the famous wallpaper issues from the Civil War. Some investigating came across the reason. One website on the history of the “Rocky Mountain News” noted that: “…When the Indian outbreak caused an embargo on traffic over the Western plains in 1864-5, he frequently ran out of white paper, and in such emergencies he printed the news on wrapping paper gathered from Denver stores…”. So this pink paper was wrapping paper. I wonder how long the need for “necessity paper” lasted. We also have two more issues with a similar date which are printed on yellow and green paper. In any case, very interesting curiosities for this fascinating hobby. 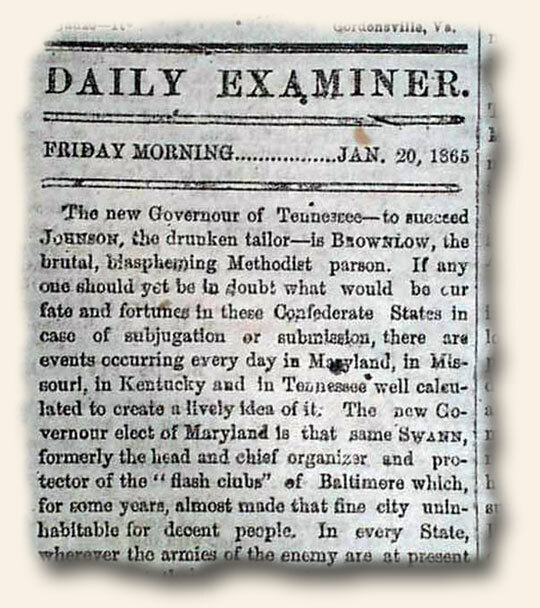 Today I decided to travel back to the era of the Civil War through The New York Times of March 4, 1863. 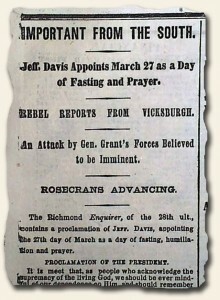 In this issue I found the Southern President Jeff Davis had appointed March 27th to be a Day of Fasting and Prayer. “…Under these circumstances it is my privilege to invite you once more to meet together and prostrate yourselves in humble supplication to Him who has been our constant and never-failing support in the past, and to whose protection and guidance we trust for the future. 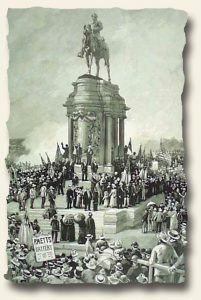 To this end I, Jefferson Davis, President of the Confederate States of America, do issue this, my proclamation, setting apart Friday, the 27th day of March, as a day of fasting, humiliation and prayer…” This is also signed in type: JEFFERSON DAVIS. Also under the “Important from Washington” are the new establishments of “The New Banking Law”; “Designs for Currency Notes” due to the recent passing of the National Currency Act; “A Branch Mint in Nevada”; as well as the establishing of “The Territory of Idahoe (Idaho)” from within the territory of Montano (Montana). “Slavery is forever prohibited within the limits of the new Territory”. What an incredible time in history! 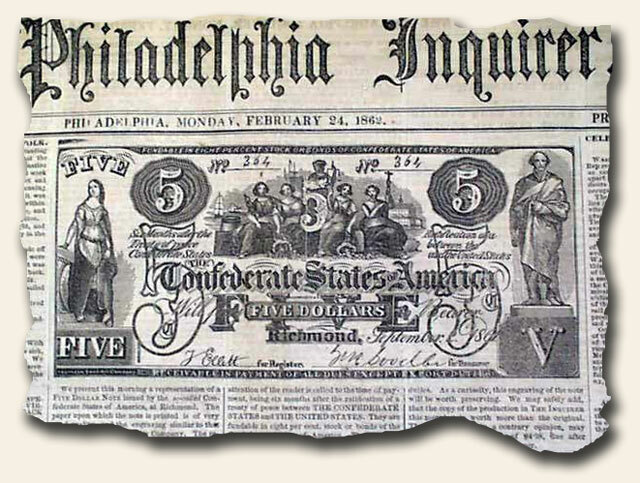 Having recently come across the Feb. 24, 1862 issue of “The Philadelphia Inquirer” (see photo) it reminded me of what this innocent looking front page image of the Confederate five dollar note did in creating a crisis in the Confederate Treasury. 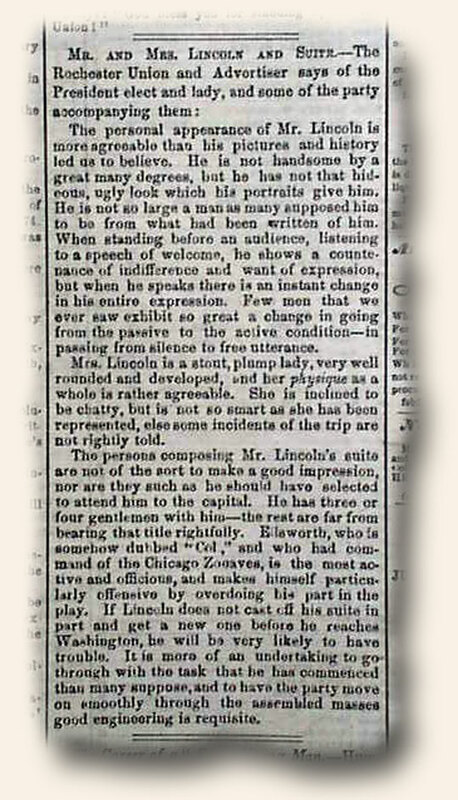 In March 1862, an unusual ad began appearing in Northern newspapers. Among the shops selling pianos and patent medicines, sheet music and sewing machines, this one stood out: it promised “perfect fac-similes” of Confederate currency. There were seven kinds of notes for sale, and testimonials from The New York Tribune and others praising the replicas for their high quality and low prices. Five cents bought you one. Two dollars bought a hundred. Fifteen dollars bought a thousand. The word “counterfeits” never appeared. These were “Mementos of the Rebellion,” sold by a Philadelphia shopkeeper named Samuel Curtis Upham. Upham didn’t look like a counterfeiter. He didn’t hide out in the woods or perform daring jailbreaks. He didn’t run from the police. He was a respectable small-business owner and devoted Northern patriot. He ran a store that sold stationery, newspapers and cosmetics. But he was also an entrepreneur with an eye for easy profit, and the Civil War offered the business opportunity of a lifetime: the ability to forge money without breaking the law. Confederate currency, issued by a government that was emphatically not recognized by the Union, had no legal status in the North, which meant Upham could sell his “fac-similes” with impunity. Over the next 18 months he built the most notorious counterfeiting enterprise of the Civil War — one that also happened to be perfectly legal. His forgeries flooded the South, undermining the value of the Confederate dollar and provoking enraged responses from Southern leaders. He waged war on the enemy’s currency, serving his pocketbook and his country at the same time. Upham first got the idea the month before, on Feb. 24, 1862. That day, customers kept coming into his shop to buy The Philadelphia Inquirer. Puzzled, he asked one of them what made that particular edition so popular. The answer was on the front page: the Inquirer’s editors had printed a copy of a five-dollar Confederate note. Philadelphians had never seen Rebel money before and were fascinated by it. Upham saw a chance to cash in. He raced to the Inquirer’s offices, bought the plate of the note, and printed 3,000 copies on French letter paper. They sold extremely well. Along the bottom of each bill, he included a thin strip that read, in small print, “Fac-simile Confederate Note,” with his name and address. The tags could easily be clipped off, transforming the “fac-simile” into an excellent counterfeit. After his first print run, Upham rapidly expanded his inventory. He took out ads in newspapers, promising to pay in gold for more specimens of Southern money. At first, it seemed possible that he sincerely thought of his reproductions as souvenirs. In early 1862, most Northerners still expected the war to be brief and glorious. They wanted “mementos of the Rebellion” before the Union crushed it. By the time Upham launched his publicity campaign in March, however, his business had clearly evolved from a modest retail operation into a high-volume wholesaling enterprise. No one needed 1,000 souvenirs: people were clearly using his products for a less innocent purpose. By then, Upham had grown his business considerably. In an advertisement published in late May, he claimed to have sold half a million notes in the past three months. He now offered 14 varieties of Confederate notes, postage stamps, and “shinplasters” — fractional bills worth anywhere from 5 to 15 cents — and printed his fakes on real banknote paper. Ingeniously, he even fulfilled orders through the mail. For 50 cents, plus 18 cents for postage, customers throughout the Union could have a hundred of Upham’s notes delivered. Southerners responded with outrage. They became convinced that Upham belonged to a covert Union plot to devalue the Confederate dollar. For the Philadelphia shopkeeper to be able to advertise his counterfeits openly and send them through the mail meant the authorities must have given him permission or, possibly, material support. 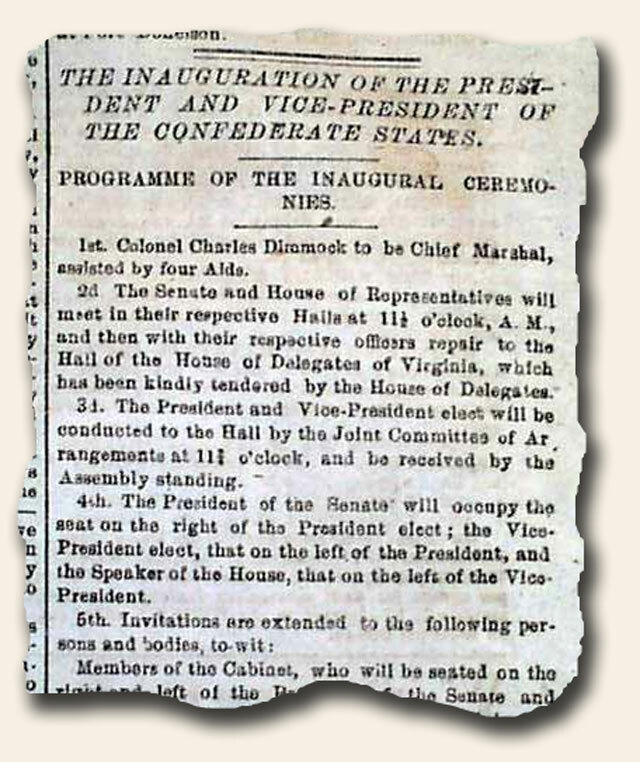 Moreover, Union troops spent counterfeit Confederate cash in large quantities — evidence of “a deep laid scheme on the part of the thieving, counterfeiting North … to undermine the Confederate currency,” in the eyes of the Daily Richmond Examiner. In the summer of 1862, Upham’s notes inundated northern Virginia, brought by Union forces marching south from Washington. A Southern journalist observed men “fortified with exhaustless quantities of Philadelphia Confederate notes,” which they used to buy everything from horses to sugar to tobacco. 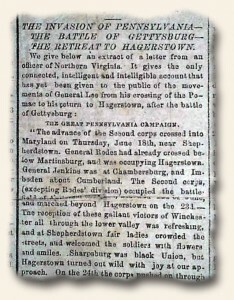 When one of the soldiers ended up a prisoner in Richmond, the Confederates found one of Upham’s advertisements on him. The shopkeeper’s counterfeits appeared “wherever an execrable Yankee soldier polluted the soil with his cloven foot,” fumed the Richmond Daily Dispatch. By the summer of 1862, as fake cash flowed across the border in ever greater quantities, the Confederate leadership took notice. 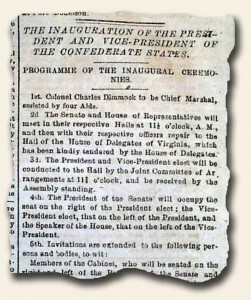 On Aug. 18, President Jefferson Davis discussed the threat in a message to the Confederate Congress. Counterfeit Confederate notes were “publicly advertised for sale” and furnished to “the soldiers of the invading army” with the full “complicity” of the Union government, Davis declared. 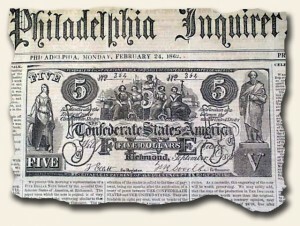 Later that day, Confederate Treasury Secretary Christopher Memminger submitted a report to the House of Representatives that reiterated Davis’s concerns and singled out Upham’s role in the crisis: “[P]rinted advertisements have been found stating that the counterfeit notes, in any quantity, will be forwarded by mail from Chestnut street, in Philadelphia.” By then, forged bills had been found far from the Union border, in Atlanta, Savannah, Montgomery and other cities of the Deep South. There was “no means of knowing to what extent they have been circulated,” the Richmond Daily Dispatch warned. Hamstrung by a disorganized government and mounting logistical challenges, the Confederacy couldn’t stanch the surge of counterfeit currency. Despite Southern claims, however, it’s unlikely that the Union government ever actively promoted the forging of Confederate money. Federal authorities most likely found it easier to ignore the forging of Southern bills than to take a position either for or against it. They certainly never interfered with Upham, who freely continued forging Confederate cash until August 1863. By that time, the value of the Southern dollar had fallen so low that it was hardly worth counterfeiting. During the 18 months that Upham operated his venture, the purchasing power of the Confederate dollar disintegrated. Between February 1862 and August 1863, the value of Confederate paper money fell by ninety percent. Upham wasn’t the only reason behind this collapse. Fake cash plagued the Confederacy from the beginning, supplied by Northern and Southern counterfeiting gangs. Gross mismanagement of Southern finances led to runaway inflation, which posed an even greater danger to the Confederate dollar. But Upham’s impact was significant. He later estimated that he had produced $15 million worth of Confederate bills. If all of that ended up in the South, it would have made up almost 3 percent of the total money supply — a large amount for a single counterfeiter. In March 1862, his business had only just begun. Over the next year and a half, he would become one of the strangest success stories of the Civil War: a legal counterfeiter, driven by patriotism and personal gain, who struck at the financial heart of the Confederacy from the safety of downtown Philadelphia. The Southern Illustrated News (Richmond, Virginia) was the Confederate counterpart to Harper’s Weekly Illustrated (NY, New York). While its distribution and duration were limited, the issues have become quite collectible. Portraits of Stonewall Jackson, Robert E. Lee, John S. Mosby, J.E.B Stuart, John H. Morgan, along with nearly every other notable figure from the Confederacy adorned the front page of this highly sought-after publication. Rare & Early Newspapers has taken on the task of posting images of every issue on Pinterest. While this project may take years, feel free to enjoy the progress to-date at: The Southern Illustrated News on Pinterest.